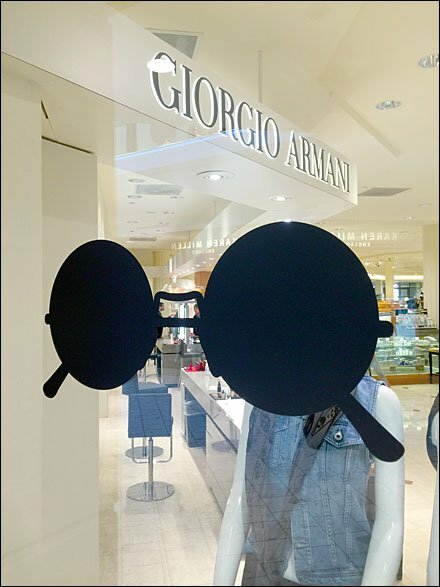 It is only by happenstance that this Lennon Glasses (Teashade) Sunglasses window cling aligns with the Giorgio Armani name in the background. Still, what headline might you suggest for the scene? I assume the sunglasses hint at the coming summer season, but found little other tie-in. Even the mannequins behind did not wear sunglasses to echo the Window Cling. Seen at Saks. Though separately it did echo the Lennon Glasses of the store’s “Sak’s Royalty, Rock Stars and Artists” in-store campaign. For Window Cling posts by Title see..
“Saks Fifth Avenue Pinterest Board“ for a visual summary.